http://newiprogressive.com/images/stories/S5/dane-county-circuit-court-s5.jpg Court undoes laws limiting the incoming governor’s power, rules they were passed during an unlawful “extraordinary session”. MADISON – The Dane County Circuit Court ruled today in favor of the League of Women Voters of Wisconsin in our suit against the state legislature. During a lame-duck session last year, the Wisconsin state legislature passed a series of laws limiting the incoming governor’s power, undermining the desire of the voters. Today’s decision undoes the unconstitutional actions of the lame-duck legislature. 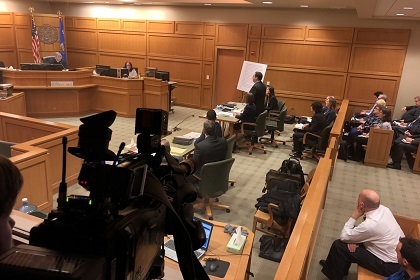 LWVWI members, staff, and board sat in the courtroom Monday afternoon to hear the lawyer representatives give their arguments on behalf of the defendants and plaintiffs in the League of Women Voters v. Knutson case. LWVWI, Disability Rights Wisconsin, and Black Leaders Organizing for Communities, as well as Green County Clerk Michael Doyle (the only county clerk elected in Wisconsin as an independent), and three Wisconsin residents, are the plaintiffs represented in the matter by Madison and Milwaukee-based law firm Stafford Rosenbaum, nonpartisan nonprofit Protect Democracy, and law firm Robbins Russell. This lawsuit is the only one that sought to invalidate the entire “extraordinary session” as unconstitutional. Today Judge Niess made his ruling in favor of the plaintiffs.